Most girls spend their adolescence thinking about clothes, boys and parties. For Jenn Ward and her childhood friend April, life was much different. They spent their teenage years raising their daughters, who were born five months apart. In the years’ following the birth of her daughter, April was struggling with mental illness. She confided in Jenn. Together, they called distress lines and went to doctors’ appointments. Jenn spent a lot of time researching and speaking to experts about what she should and should not do. “It’s a scary and terrifying thing to love somebody and to know that your love for them may not be enough to keep them in this world with you,” she says. On March 11, 2001, April died by suicide. Jenn was the one who found her. It was an extremely traumatic event in Jenn’s life. It transformed her entire world. But it wasn’t only about her. April left behind a seven-year-old daughter, and Jenn faced the very real issue of trying to raise their children in the aftermath of suicide. She soon began to re-evaluate her career and her life. She was no longer feeling fulfilled when she went to bed at night. She needed to make a change. Jenn began volunteering with suicide prevention organizations in her community. She left her career in the finance and technology sector, and went back to school to study social work. 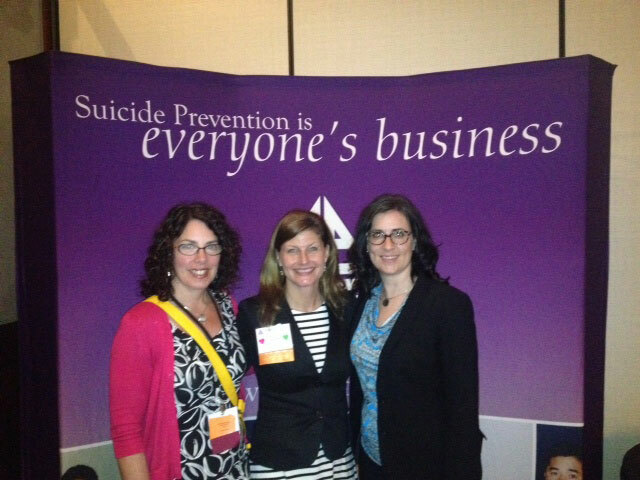 Today, Jenn holds the role of Survivor Chair on the board of the Canadian Association for Suicide Prevention. She focuses on helping to educate others, sharing her experience, and working to change the way people think — and talk — about suicide and mental health issues. Though April’s absence will always be vivid, the work Jenn does in suicide prevention, intervention and postvention has allowed newfound peace and possibility. A lot has changed since April’s death — not only in Jenn’s life, but also in the world around her. There has been tremendous progress in the way we talk about mental health and suicide. This is especially evident in the media coverage surrounding the death of Robin Williams. For a long time, the media did not report on suicide. Journalists operated under the belief that writing about suicide would lead to more suicide, due to evidence of suicide contagion. But talking responsibly about suicide — in a manner based on facts and respect — does not cause suicide. The media, and the public at large, should be talking about suicide. We just need to be mindful of what we say. We need to focus on understanding and preventing suicide, and advocating in a meaningful and hopeful way. For the media, this means following the appropriate guidelines for reporting on mental health, and reaching out to experts in the field. It means focusing on messaging that will continue to affirm life and promote help seeking. So, let’s talk about suicide. Let’s encourage others to have careful and candid conversations about suicide. For Jenn’s family, suicide exists at the dinner table and at every family gathering, because there’s always an empty chair. Her younger children know their older sister’s mother died by suicide, because she has been raised alongside them. But most families are not having these conversations. The circumstances of Robin Williams’ recent death have presented us with an opportunity to inspire hope and resiliency, to encourage others to come forward and share resources and their experiences in a positive way. It’s reassuring to see the media share stories of his legacy, reminding us it is how a person lived, not how they died, that defines them. This is how we will reduce feelings of isolation and stigma. This is how we will increase coping skills in the lives of those who have been affected by suicide. This is how we will change the world for people like April and Jenn, people like your sister or father, people like you and I.